What Are Lottery Pools and How Do They Work? Have you ever seen one of those mega lottery jackpots giving away hundreds of millions of dollars and thought, "I'd be happy if I could just win a fraction of that amount?" If so, a lottery pool might be for you. Lottery pools are a way of getting better odds of winning a lottery without having to pay more money for tickets. A group of people chips in money to buy lottery tickets with the agreement that if they win, they will split the pot. So each participant will receive less money than if he or she had bought the ticket themselves, but they also get better odds of winning in the first place. Here's a simple example: your office lottery pool has 50 members. Each of your coworkers contributes a dollar. 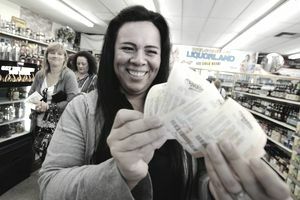 The lottery pool manager then buys 50 $1 lottery tickets and holds them safely until the lottery drawing. Now, let's say that lottery pool was very lucky and won a $50 million lottery jackpot. Each of the coworkers who participated will receive a million dollars (before taxes, of course). For the $1 buy-in, the lottery pool participants had 50 times the chance of winning for 1/50th of the total prize value. Some lottery pools are more complicated. For example, they may allow people to buy more "shares" of the pool by contributing more money. If one of the participants in the example above had contributed $5 instead of $1, and the lottery pool manager had used the extra money to buy 55 tickets instead of 50, he or she would be eligible to receive 5/55ths of the jackpot. What Do Lottery Pools Do With Smaller Prizes? Of course, it's much easier to win $5 in a lottery than $50 million, and $5 divided by 50 is hardly worth even dividing out among the lottery pool participants. So what do lottery pools do with small prizes? There are two options, depending on the size of the prize. The lottery pool can choose to either divide the small sum between the participants or, if the group buys lottery tickets regularly, they can choose to put the prize amount toward buying more tickets for the next lottery drawing. The chances of winning the lottery are very small no matter what you do, there is no secret that can guarantee that you'll hit a jackpot. But lottery pools are a way of increasing your odds without increasing your risk of losing your financial investment in a long-shot dream. According to an ABC News article, a 49-person office lottery pool at SEPTA, a Pennsylvania transit agency, won a Powerball jackpot for $172.7 million in April 2012. As a CNN article relates, a 7-person office lottery pool at New York State's Division of Housing and Community Renewal in Albany split a $319 million Mega Millions jackpot in March of 2011. Huffington Post shares the story of an office lottery pool at Quaker Oats that shared a $241 million Powerball jackpot among 20 employees. A few months later, they won a $10,000+ prize as well. MetroNews in West Virginia reported that after 20 years of trying, the Mountaineer 26 lottery pool scored a million-dollar jackpot. There have also been many reports of lottery pools that have ended up in lawsuits or people being cheated out of ticket money or wins. It's a good idea to set up a set up a lottery pool contract before you get started, to make sure that everyone is treated fairly. Who Participates in Lottery Pools? Office lottery pools are popular because it's easy to get a big group of people to chip in a few bucks each toward a chance of winning. It also helps to encourage people to get to know one another across departments. But any group of people can create their own lottery pool; groups of friends or relatives, your local sweepstakes club, neighbors in an apartment complex, or members of any other social group might be interested in participating. Do Lottery Pools Ever Cause Problems? Unfortunately, yes. With a lot of money on the line, people can act badly and try to cheat fellow players. Lottery pool members have been sued for various reasons, including conflicts over who participated in the pool, whether tickets were purchased privately or for the group, whether the proper numbers were played, and more. There have also been cases where unscrupulous people collected money for lottery pools then pocketed the cash without ever buying the tickets. These problems can be avoided with a little preparation. Depending on your location, lottery pools may be illegal, so it's important you check before you decide to start one. Lottery pools are a form of gambling. In the United States, there are no federal laws prohibiting gambling, but individual states can, and do, prohibit it. If gambling is prohibited in your state, lottery pools are as well. If you're wondering whether playing the lottery is legal in your state, check whether your state runs a lottery. If your state has no lottery, it's a good sign that gambling could be illegal. You can also search for your state's gambling laws. Findlaw.com has a list of gambling and lottery laws by state which could help. Does Your Workplace Prohibit Lottery Pools? Aside from laws prohibiting gambling, you also want to be sure that your workplace does not prohibit lottery pools during work hours. In some companies, gambling on the job is a fireable offense. Before you start an office lottery pool, check your business' code of conduct or employee handbook to see if there's a no-gambling policy. If you're still not sure, check with your company's human resources department. If you are a government employee or a civilian working at a government facility, you face additional restrictions. Lottery pools that take place "on Government-owned or leased property or on duty for the Government" are prohibited, according to Cornell Law School. Before you get started, check with local laws and with your company's human resources department (if you're starting an office lottery pool) to ensure you are not breaking any laws or guidelines that could turn a fun lottery pool into a serious problem. If you decide to go ahead with your pool, make sure you have a good contract to protect yourself and your coworkers. Good luck!